Those of you out there who love bacon in any format (even in a sundae, topping a Cinnaburger, or dipped in chocolate) will totally get this. 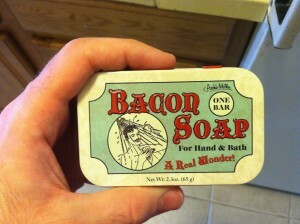 Now the world of personal hygiene has been turned on its ear with the invention of bacon soap! Not only can you smell like a couple hundred pounds of smokey pig fat but I’d suggest you make this a go-to gift item! Then sit back and just watch those thank you notes pour in. Get bacon soap online at (where else?) Think Geek. 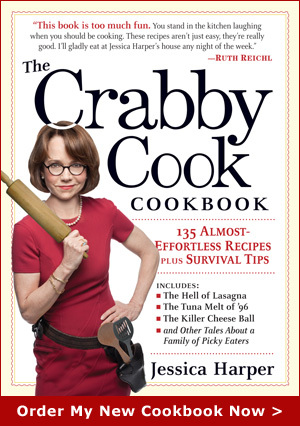 This entry was posted on Wednesday, June 27th, 2012 at 4:29 pm	and is filed under Cool Products. You can follow any responses to this entry through the RSS 2.0 feed. You can leave a response, or trackback from your own site. OMG, Jessica! That you just plugged ThinkGeek rocks my world! My food, music, art, culture, and hygiene preferences just collided and made a massive bacon-scented, heavenly-voiced, mushroom cloud that knows who Jonathan Coulton is.